The episode begins with a scene from the distant past, when He Lan Jing (known as ‘Ah Xi’ in this life) was a boy. He spends his evening admiring the full moon when Huiyan silently sneaks up on him. Of course it doesn’t work as Ah Xi says, “Huiyan, is that you?” Huiyan giggles as she asks him how he knew it was her. Ah Xi, giggling himself, says that of course he knows. Cute. We learn that as a young boy, He Lan Jing didn’t have the ability to see at night. He must’ve grown out of it, or somehow overcame it over time. 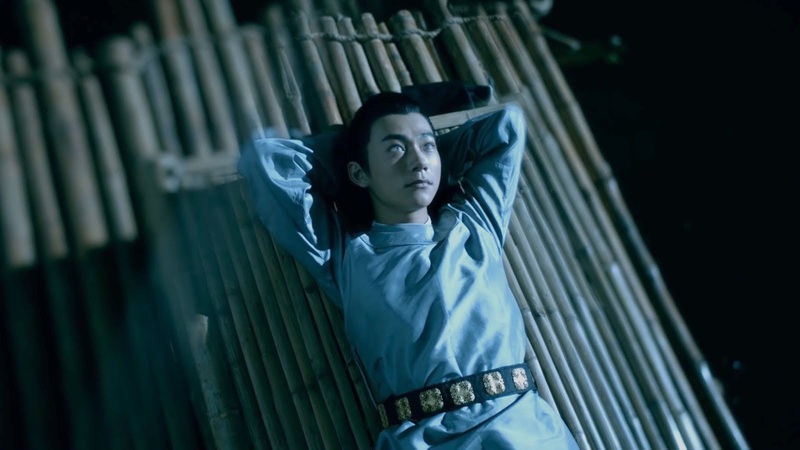 When Huiyan asks what he's doing, Ah Xi tells her that he's “moon-bathing” since his father said it was good for him. After Ah Xi tells Huiyan that he is growing tired of moon-bathing, Huiyan sits down next to him to keep him company. She tells Ah Xi that looking at the moon makes her think she can see her inner heart. Ah Xi: “I really wish I’ll be able to see the moon with you one day”. Huiyan says his wish will definitely come true, and Ah Xi shyly moves his hand closer to hers. These two are so adorable, I just love them. Back in the present day, Pi Pi wakes up, still feeling ill from seeing He Lan Jing's eyes the day before. It looks like she really won't recover until she takes a bite of one of He Lan Jing's apples. She straightens the picture of her and Jia Lin that He Lan Jing knocked over the night before. Pi Pi’s coworker Wang Xuan (ugh – don’t like her one bit) has gone to interview Qian Hua using the name 'Zhang Nan' to get her foot in the door. Qian Hua is beautiful and elegant, and seems to be a person who doesn't put up with any nonsense. Wang Xuan greets Qian Hua and thanks her for agreeing to an interview, but Qian Hua is just aloof and standoffish. Ha. Wang Xuan starts the interview by claiming that she is a loyal customer of Qian Hua's makeup line, and asks what Qian Hua would consider to be the product's unique appeal. Qian Hua gives a one-word answer, “Nature”, and chooses not to elaborate. 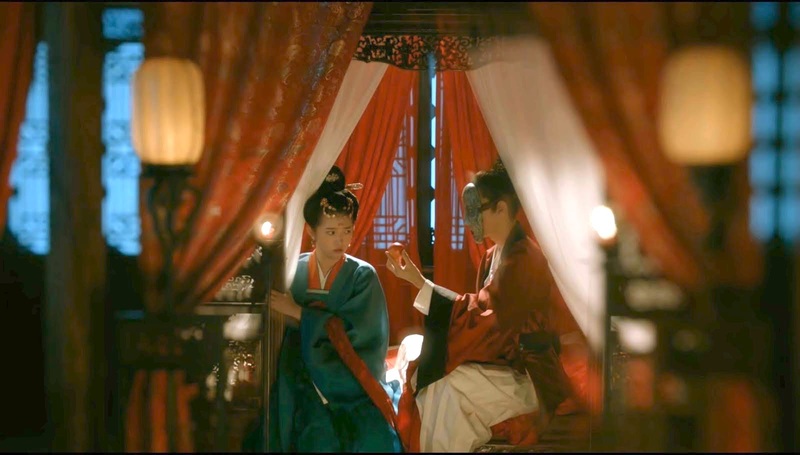 Wang Xuan decides to take a different (and rude) approach by asking Qian Hua whether she has many suitors. Qian Hua looks up from the papers she is reading on her desk, and glares at Wang Xuan. 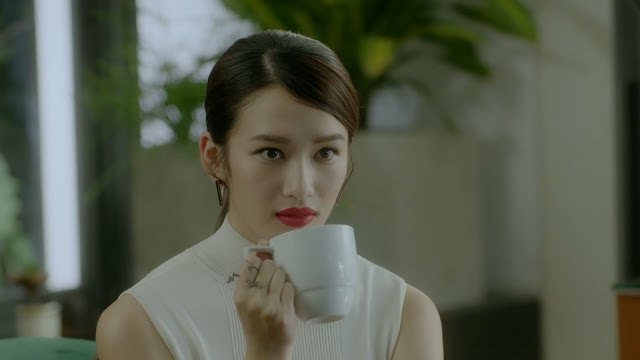 She's done putting up with Wang Xuan's nonsense (that makes two of us) and asks Wang Xuan if she really is a loyal customer, because loyal customers would know that the company values the environment and refuses to test its products on animals. In fact, the lipstick that Wang Xuan has on are made by companies that engage in animal testing. Qian Hua asks Wang Xuan if it was worth the lives of hundreds of animals to be killed for Wang Xuan’s “not so pretty” face. Qian Hua is awesome. She calls Wang Xuan stupid for trying to land a scoop with such shallow questions. Qian Hua then calls Wang Xuan by her real name. When Wang Xuan shows her surprise, Qian Hua declares that her people have done a thorough background check. She has her assistant give Wang Xuan a free sample of her company’s natural lipstick, before Wang Xuan rushes to leave, completely flustered. Serves her right. I'd want Qian Hua on my side going into any fight - she doesn't pull any punches. Xiu Xian – He Lan Jing’s comrade – arrives as Wang Xuan is leaving and says that Qian Hua’s temper is as bad as ever. Qian Hua is a member of the Fox Clan as well and He Lan Jing's right hand woman. She is helping He Lan Jing decode some ancient Fox Clan texts. 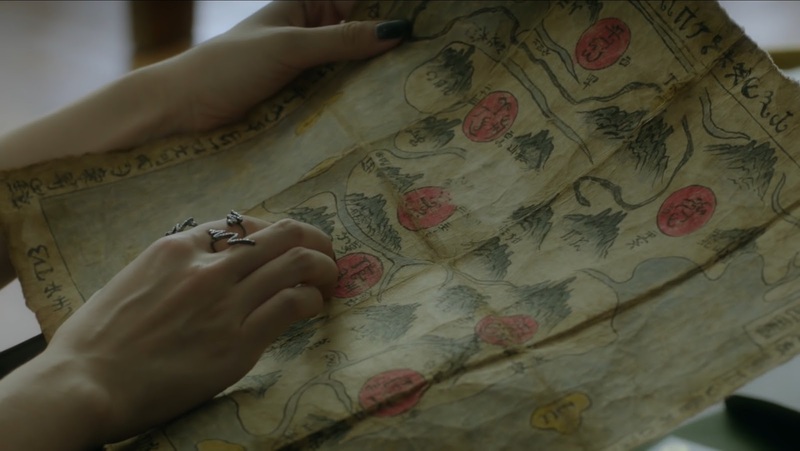 Xiu Xian arrived to give her a map to find the elders of the Fox Clan who might be able to help. Xiu Xian says it’s all right if she can’t figure it out – after all, she’s been trying for so many years, she can always try again later. Qian Hua said that He Lan Jing should send Kuan Yong next time – he doesn’t talk as much. Wang Xuan storms back into the newspaper office, yelling about how Qian Hua is a psychopath for talking to her that way. Really? Because I think Qian Hua is pretty awesome, and you're the one acting crazy right now. I also notice how Wang Xuan didn't have the nerve to say any of this directly to Qian Hua. The reporters decide to try a different method, and interview the mysterious ‘Mr. He Lan’. 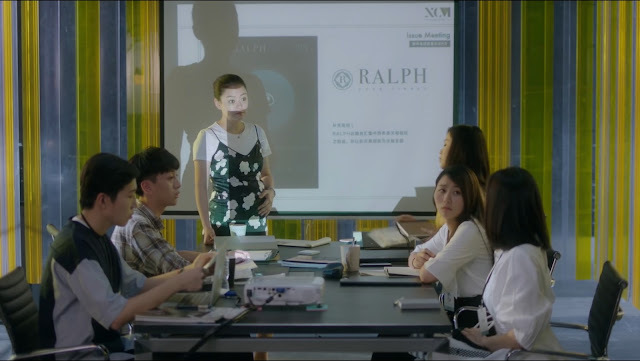 A coworker points out that Wang Xuan’s identity has already been exposed, and they decide to send Pi Pi (who had been napping in the background for most of the conversation) to go to He Lan Jing’s home to try and take some pictures. That evening, Pi Pi climbs a tree near He Lan Jing’s house and has her camera out ready to take pictures. Over the phone, Xiao Ju asks if Pi Pi really intends to become a paparazzi, instead of becoming a real reporter. Pi Pi says that being a reporter is her dream, but she has to earn a living. She doesn’t realize that He Lan Jing is standing at the foot of the tree, and he calls up to her, “What are you doing?” Surprised and still sick, Pi Pi has a nosebleed and then falls from the tree. He Lan Jing carries her inside an feeds her a bite of an apple to help her recover before she falls out of consciousness again. We flashback to the past where a young He Lan Jing had given a young Pi Pi an apple to eat before he removed his mask to let her see his eyes. Pi Pi wakes up and finds He Lan Jing on the chair next to her. Thinking he is asleep, Pi Pi comments about how rich and handsome he is, but that it's unfortunate that he can’t see. He Lan Jing suddenly speaks up: “What are you doing?” He admits that he was awake the whole time, of course. Pi Pi asks He Lan Jing what he’s doing, and he responds that he is moon-bathing. Pi Pi says that she’s only ever heard of sun-bathing. Pi Pi: “You’re not blind?” He Lan Jing: “I’m only blind during the day time, I can see at night.” Pi Pi finds this really hard to believe. She stands up to leave, but she’s not fully recovered and collapses back onto the chair. 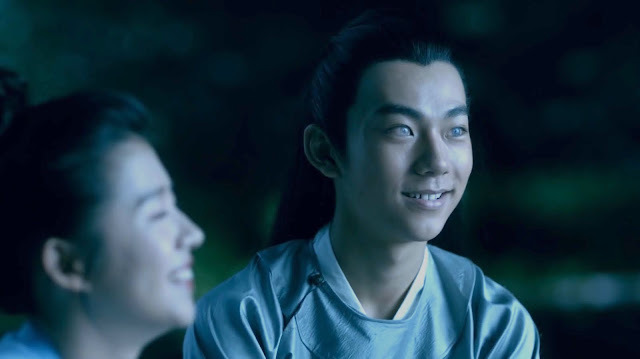 He Lan Jing tells her to stay and enjoy the moonlight with him. He tells her that he started moon-bathing when he was a child, and at the time there was a beautiful girl who would accompany him. Back then, he couldn’t see during the day or night. By the time he could, the girl was gone. Aww. She was his first love. In an echo of the past, Pi Pi says that when she looks at the moon, it's like seeing her inner heart. He Lan Jing says she’s right in that the moon represents a person’s subconscious, or inner heart. Pi Pi falls asleep. The next morning, Pi Pi wakes up inside the house to see Qian Hua standing nearby. She brought a huge selection of clothing, shoes and makeup for Pi Pi to choose. It turns out that He Lan Jing had reached out to her to bring new clothes for Pi Pi to wear to work, Qian Hua, being the only woman he knows. She also hands Pi Pi an invitation in a black envelope before leaving. Meanwhile, He Lan Jing and his two sidekicks pull their car up outside an office building. He Lan Jing says he can feel the energy of the orb inside, and says that when his love died a hundred years ago in the war, he didn’t even get to see her one last time. Xiu Xuan and Kuan Yong exchange looks like they’ve heard this story a million times already. Lol. It turns out there is extremely tight security around the building, and they decide to follow their original plan to steal the orb that evening. Just then, a members of the building’s security team tells them they can’t park there and they have to leave. Pi Pi takes the bus to go to work, dressed in a long white dress that she had selected from the rack of clothes Qian Hua presented. I think she looks pretty in it, though very out of place sitting on the bus. Pi Pi opens the invitation Qian Hua had given her, to see that it's for an exclusive auction that evening. Pi Pi hurries into work, and bumps into one of her coworkers who notice her outfit. Pi Pi is wearing the same dress that's being featured on the magazine that she's reading. Pi Pi makes it to the meeting where Wang Xuan is telling the group that she’s learned that He Lan Jing has a strong interest in antiques, and will be attending an auction that night. The same one that He Lan Jing gave Pi Pi an invite to attend as a VIP. Pi Pi’s boss intends for Pi Pi to attend, when Wang Xuan immediately disagrees. She says they can deal with Pi Pi not having the right clothes, but even if she did go, she doesn’t have an invitation. Only a few guests have been invited as VIPs, while everyone else has normal entrance tickets and she has managed to get an entrance ticket from her uncle. Wang Xuan's thrown out every argument she can think of for Pi Pi not to attend, but their boss still tells them to go together. Wang Xuan says that at the event, she’ll have no time to look after Pi Pi. I can’t stand this girl one bit, she’s so stuck up and annoying thinking she’s better than everyone else, especially when it comes to Pi Pi. I really hope we don’t have to see much of her in this drama. Jia Lin texts Pi Pi to ask her if she’s free that evening, but Pi Pi responds that she has to work that night. Pi Pi starts to look up information online on visas to the United States, where her boyfriend is going to study. Pi Pi goes to see Xiao Ju at her café and she runs into Xiu Xuan and Kuan Yong. Xiu Xuan and Kuan Yong are there to deliver the dress for Pi Pi to wear at the auction when Pi Pi says that she’s actually not going. Xiu Xuan jokes that she should return the invitation then, and is taken aback when Pi Pi doesn't think twice about giving it back. After a brief call with He Lan Jing, Xiu Xuan tells Pi Pi that if she agrees to attend the auction, He Lan Jing will agree to an all day interview with her. She sees how great a deal this is, and decides to accept the dress. 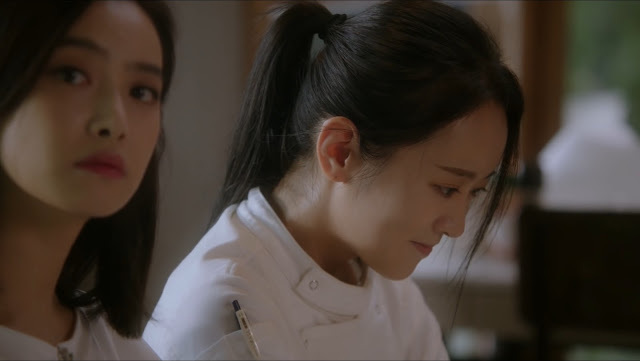 We learn that Pi Pi has booked an expensive restaurant for her and Jia Lin to have dinner, and is daydreaming about how romantic it will be, as Jia Lin will bring her roses, and then they will go and ride the ferris wheel. Xiao Ju can't believe it when Pi Pi pulls out a letter that Jia Lin wrote to her in fifth grade promising to marry her. This girl desperately needs to wake up and get a reality check. I don’t think she sees that while she’s making up all these dreams in her head, Jia Lin is thinking about something else entirely. Just then Jia Lin goes to see Tian Xin at her classroom. Tian Xin’s classmate jokes that her boyfriend has come to visit her, and is surprised when Tian Xin says isn’t actually her boyfriend, even though he has been coming to visit her everyday. Jia Lin invites Tian Xin to dinner as thanks for helping him with his recommendation letter, just the two of them. I think it’s obvious that Jia Lin’s feelings for Pi Pi are not as serious as they were before, and I think he’s started liking Tian Xin instead. Pi Pi comes to visit them at school, and when Tian Xin sees Pi Pi’s papers on applying for a visa, she offers to help translate them for Pi Pi. 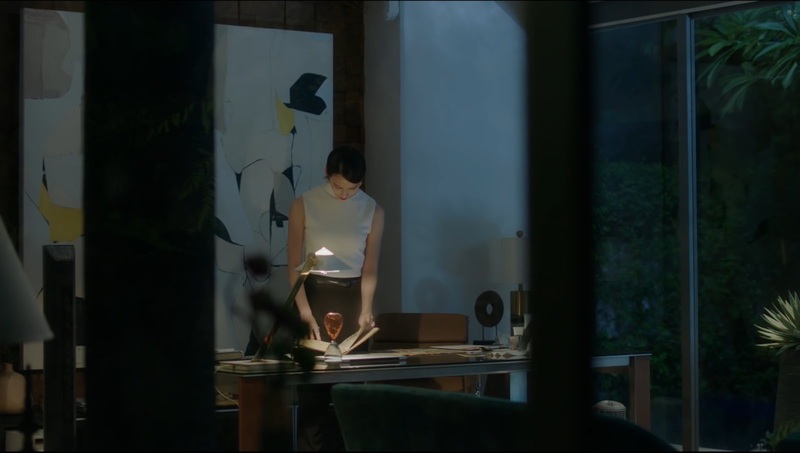 She bails on dinner with Jia Lin and tells him that they shouldn’t make plans to have dinner when it’s just the two of them. I’m not liking Jia Lin – he's being a terrible jerk. If he doesn’t love Pi Pi anymore, he should tell her and break up with her, instead of stringing her along when she's making plans and dreaming about their future together. On the other hand, I think Tian Xin is doing her best to be a good friend by trying to maintain a distance between her and Jia Lin, even though she likes him. 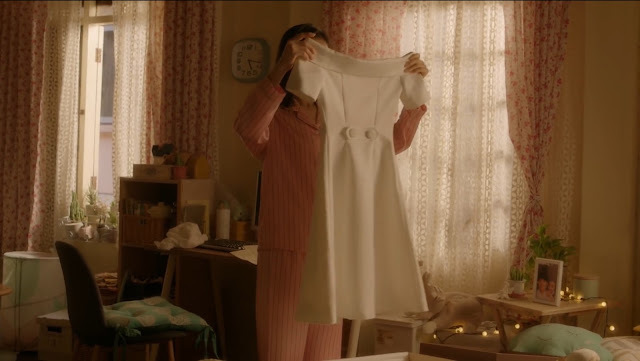 At home, Pi Pi opens the box from He Lan Jing to find a beautiful white dress. In a voiceover, Pi Pi says that when a person loves someone, they will do a lot of wishful thinking and put in a lot of effort to make the other person happy. Even when they know that all the effort may not go anywhere, they don’t know what else to do. Her words are relevant for most of the characters of this drama, including herself, who wants to go to the United States to be with Jia Lin. It applies to Xiao Ju, who likes one of her friends, and Qian Hua, who is working hard to help He Lan Jing. Of course, it applies to He Lan Jing as well, who is doing his best to win Pi Pi over. Qian Hua is visited by Zhao Song, another member of the Fox Clan and a nemesis to He Lan Jing. He calls her a ‘backup’ to He Lan Jing, but warmly welcomes her to visit the North where he lives. He clearly likes her! I think it is one of the better cdrama that came out this year! Watched 1-8 in one go, loving it so far and can't wait for the rest! thank you for your recaps! i didn't expect much from this drama but the first episode changed my mind! keep up the great work! It's one of a few dramas I wish it's longer... Why so short?